Dirt bikes are bikes that have been motorized and designed to be operated on dirt roads or pathways instead of on the street or pavement. Dirt bikes come in four different types; motocross, trail, mini, and dual purpose. 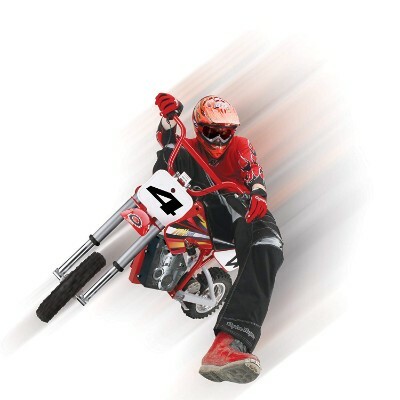 When determining what is the best-suited dirt bike for your young rider it is best to figure out their level of riding experience and then determine what they intend to use the bike for. Each rider has different levels of experience when it comes to riding. There are many benefits to having young riders who express an interest in riding to learn how to ride and operate a dirt bike at a young age. Along with the benefits also comes the responsibility of the rider and the adults assisting them. The benefits not only help them physically but mentally as well. 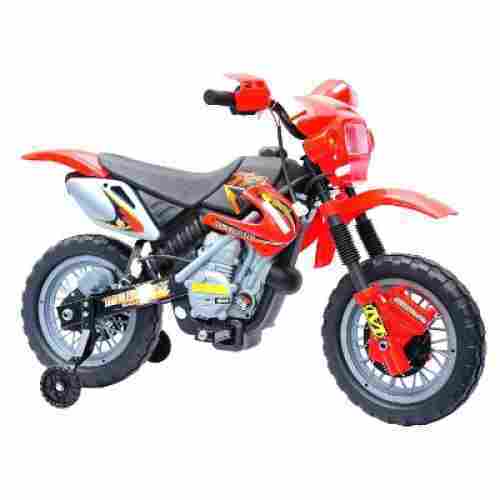 When little riders are ready to ride this ride on plastic dirt bike is ideal for children. It features speeds up to 2 miles per hour and has two tires added to the rear tire for stability. 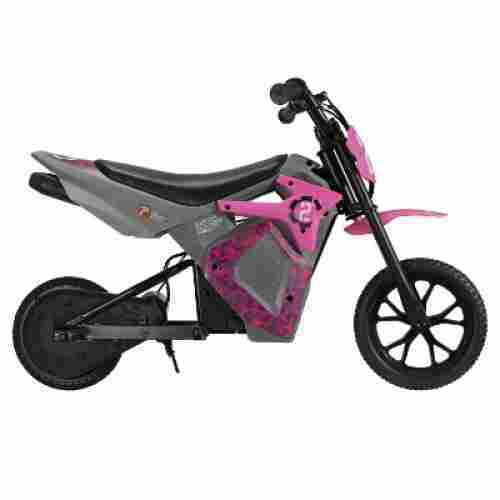 The bike is powered by a 6V battery that is rechargeable along with an on and off switch for added adult control when working with young riders. The bike offers bright colored green frame with decals and graphics that add to the cool factor. It also features working headlights and an AUX jack that can be used to play music. 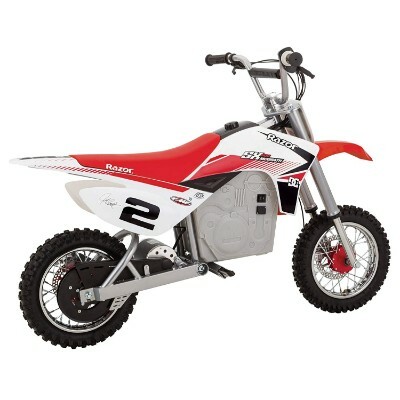 The weight limit on the dirt bike is 44 lbs and is best suited for children 3 years old to 8 years old. 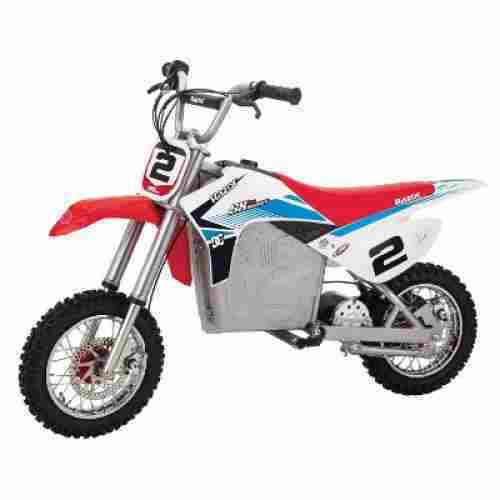 Little dirt bike racers can get their first experience on this bike. 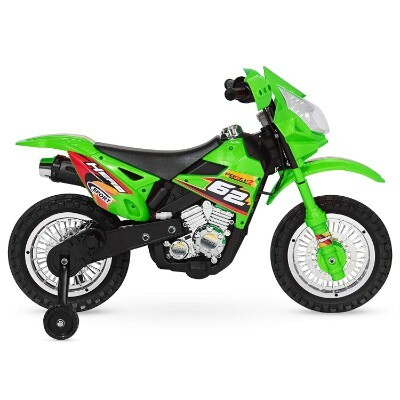 When it is time for them to hit the back yard and start their engines this battery powered 6V durable plastic dirt bike is a great choice. When young riders are encouraged to learn to ride it boosts their hand eye coordination, promotes gross and fine motor developmental skills, and encourages cognitive developmental skills. This is a great starter bike for any young rider. It features two additional wheels on the rear tire that act like training wheels. This makes it very safe for riders that are not as balanced as others. It offers speeds up to 2 miles per hour, headlights that light up, and an AUX jack to add music to the ride. The weight capacity is 44 pounds and it is best for riders under the age of 8 years old. All the awesomeness in a small plastic bike that gas powered dirt bikes offer. This is a bike to offer to young riders that need extra support and stability while learning to ride. The working headlights and AUX jack add to the awesomeness of this bike. This bike offers speeds of up to 17 mph and 40 minutes of riding time on a single charge. The bike is constructed from steel for added durability out on the track. It has a varied speed control with a chain driven engine that features a high torque for maximum power. The grip system features the acceleration controls and makes for added control for the rider. The front tire is 16 inches and the back tire measures in at 14 inches with large knobs to add to the traction control on the track. The added power with speeds up to 17 miles per hour is awesome for more advanced young riders this adds to the thrill and excitement of learning to ride. It is low enough for younger riders but also has a greater weight limiting allowing older riders to enjoy as well. This bike is a great way to promote a physical fitness lifestyle for kids, encourages gross motor development skills, and strengthens the mind dexterity. The is a blast for young riders wanting to get out on that track. 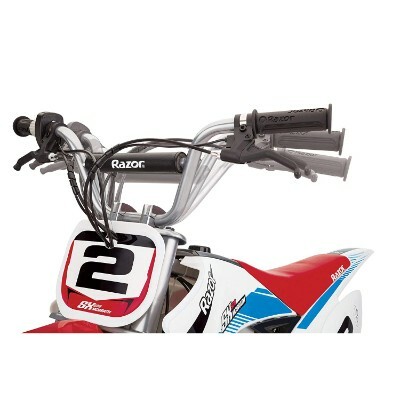 The Razor allows young riders to race around the track just like their motocross superstar idols. The high torque electric powered engine packs a punch and can allow riders to go up to 17 miles per hour. This engine is chain driven and powered by two rechargeable batteries that are included. It also features a braking system with dual discs and acceleration that is controlled by the twisting of the grips. Each charge offers 40 minutes of riding time. The frame of the bike is constructed from steel and is super durable on the track along with holding riders up to 220 lbs. 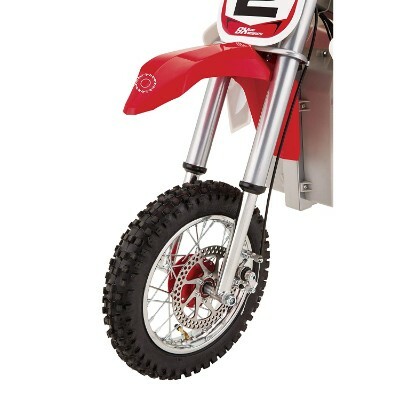 This is a dirt bike that is featured for young children that are just learning to ride. 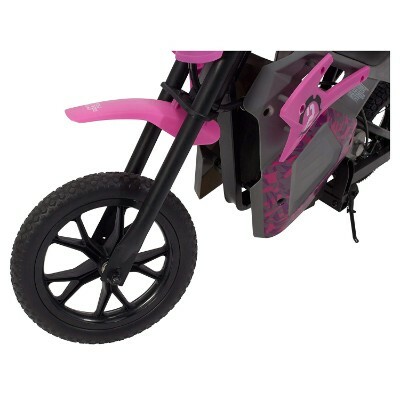 it features two wheels attached to the main back wheels for added stability and adds to the experience for young riders. The speed of the bike tops out at 2.5 miles per hour making it easy to follow behind and safe for learning riders. It is only recommended for children under 55 pounds. One charge of the batteries offers up to 45 minutes of riding time. The frame and wheels are constructed from plastic. 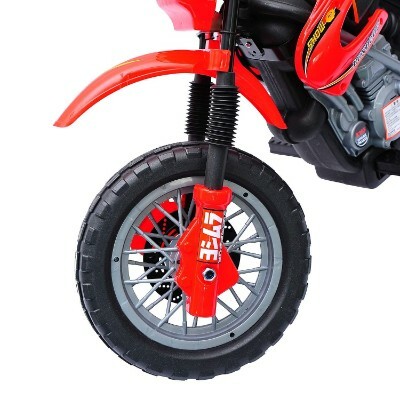 It is a motorbike that looks and feels like the big dirt bike, but has been constructed out of plastic and features support wheels on the back tires for younger riders. The top speed of the bike is 2.5 miles per hour. This makes it easy for parents to assist young riders and adds to the fun experience for everyone. This beginner bike is great for young learning riders along with boosting their self-confidence, encouraging gross and fine motor skills, and promoting their hand eye coordination. 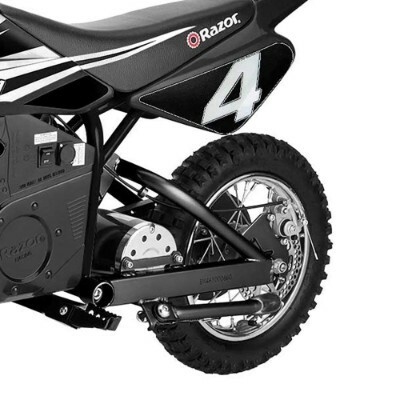 This 4-wheeled dirt bike is great for learning riders and assisting parents. 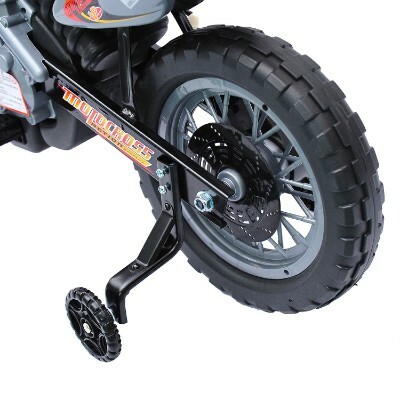 The added support system on the rear tire add to the fun experience for young riders. 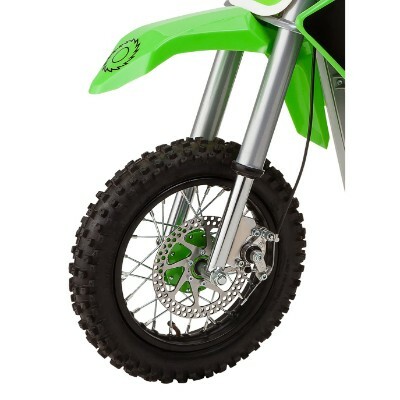 This allows for parents to enjoy watching their young children ride a dirt bike without having to help them balance. The low speed and plastic construction really make it ideal for young children. It is able to be powered on wet grass, over rough terrain, through ruts, and mud without any issues. One battery charge offers about 45 minutes of riding fun. This bike is designed with the motocross winning star Jeremy McGrath's bike as inspiration. The graphics on the bike and the frame are the same design featured on his winning bike. The electric powered bike allows a rider to ride for up to 40 minutes and speeds of 15 mph. The large knobby tires and dual suspension give the maximum traction with the smoothest ride. The engine has a high output that allows for varying speeds that give the rider a full supercharged experience. 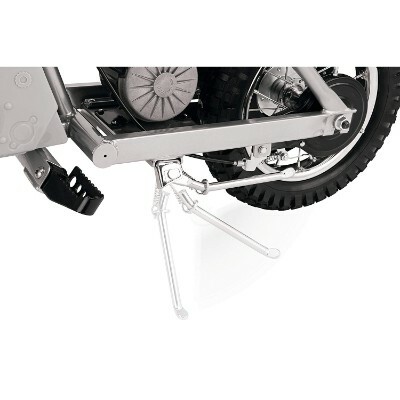 The kickstand that is retractable and the braking system is dual disc with hand controls add to the experience as well. The bike is suited for riders up to 175 lbs. The Bike is a powerful electric powered motocross dirt bike that will give a great experience with all the features and graphics that Jeremy’s bike has too. When riding dirt bikes riders are able to increase their physical fitness level, develop strong gross motor skills, and boost their cognitive developmental skills. 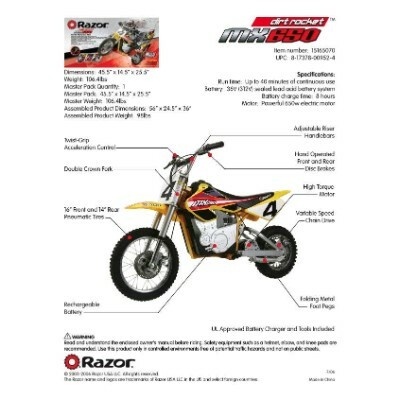 The authentic look of the bike with all the graphics to match the motocross superstar’s bike make it an awesome bike for kids that look up to Jeremy McGrath. 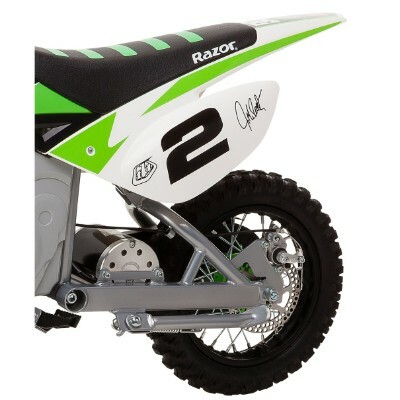 The Electric Bike features all the stickers and great design on Jeremy McGrath's motocross winning bike. The steel constructed frame, stickers, and graphics make this bike not only fun to ride, but awesome looking. 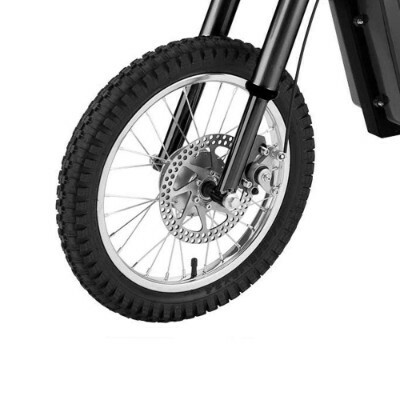 The tires featured on the bike have the specs of a motorcycle with the specific tread on both the front and the back. 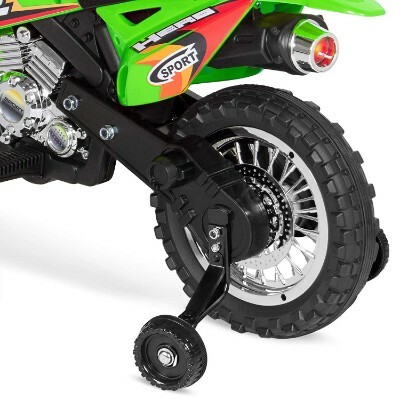 The back tire is 14 inches and the front tire is 16 inches giving it maximum traction and power. The acceleration and braking system are controlled with controls on the grips making it easy to control and handle. The electric powered engine is chain driven, has a high torque, and features 3, 12V (36V) batteries. The dual suspension and braking system add to the value of this smaller electric bike. 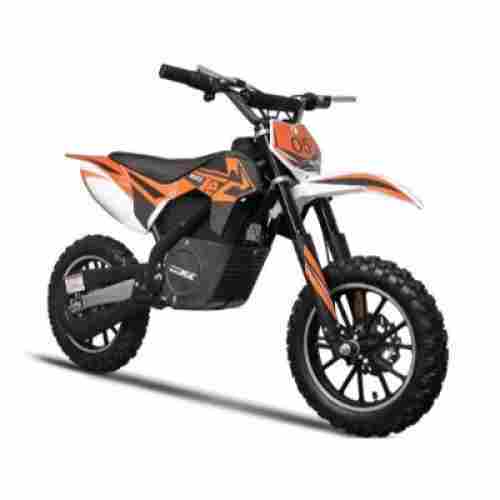 It’s powerful, yet scaled down and battery powered for off road riding for kids under 140 pounds. 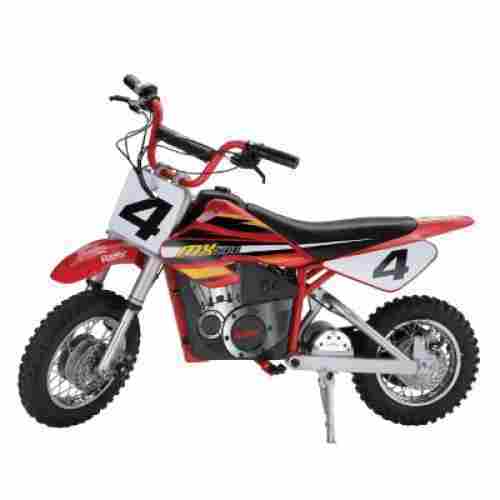 This motocross dirt bike has been designed to be super quiet but also features a powerful motor that is chain driven that is controlled on the handlebars that contain a twist grip throttle. The large knobby tires grip the surface taking them places that are fun and exciting. The brakes are controlled by hand and placed on the rear tire for maximum stopping power and control. When the battery is fully charged it will offer riders up to 30 minutes of riding time with speeds up to 14 miles per hour. This powerful and low maintenance bike will make a perfect bike for your young rider. 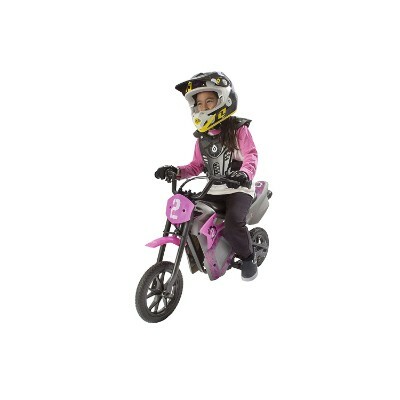 The MX350 is a great introductory Motocrosser for your kid. It boasts of the signature quality craftsmanship that Razor is widely known for. Just make sure that your kid will be riding it complete with protective gear. 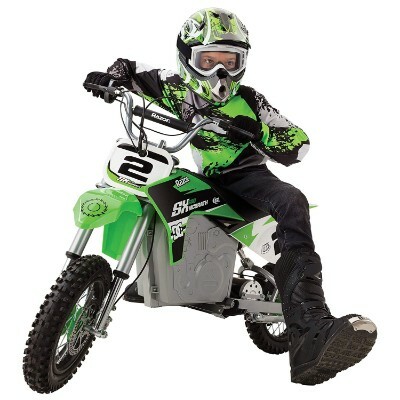 This is the ideal introductory dirt bike for your kid! It can be the first real experience with a motor vehicle. As your child's confidence builds, he/she will have a bike that grows along with them. Additionally, children should be at least 13 years old when riding this vehicle. Unlike the electric cars and bikes for young children that go at a snail’s pace for safety, this dirt bike can satisfy just enough of that need for speed. And, you don’t have to worry about safety, since the pneumatic tires are of the highest caliber for shock absorption. The 12 mph maximum speed is the perfect complement to a preteen, giving the correct sense of ease and responsibility appropriate to the age range. Safe on all terrains. The SX500 comes complete with the signature dirt bike frame used by McGrath himself in all of his Superbikes. It also comes with shatter-resistant fairing design and authentic McGrath graphics to give your child a feeling of being a champion himself or herself. 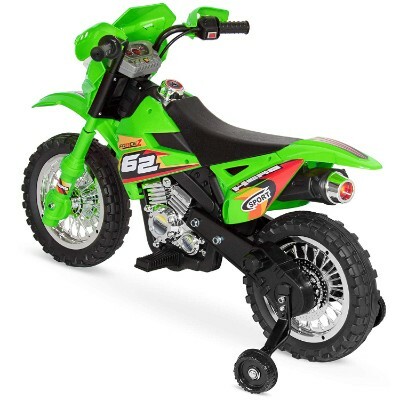 With 16-inch knobby front tires and a 14-inch wide, traction-perfect rear tires, the SX500 is sure to provide the Supercross championship experience that your kid so desires. With three units of rechargeable 12 volt batteries, it’s an ideal ride that can be enjoyed for hours. If your child didn’t know who Jeremy Mcgrath was before getting this bike, you’re likely to create a lifelong fan and the sport of Motocross! Instills confidence by giving the authentic design of a champion racer. And, it lives up to this as well! The variable speeds and dual suspension makes for smooth handling, while the disc brakes allow it to stop on a dime! It’s got dual suspension to give the SX500’s sturdy steel frame outstandingly smooth ride regardless of the roughness of the terrain. 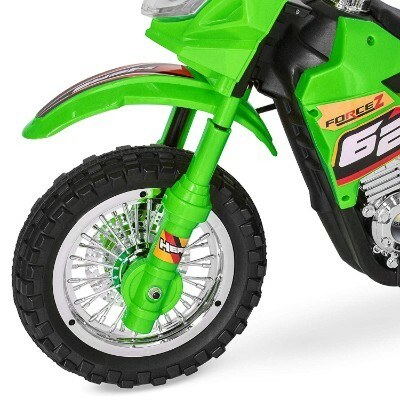 The chain-driven motor, a signature of Razor machines, comes with variable speed and not the usual 2-speed settings you can see from other electric dirt bikes for kids. The motor is powered by 3 units of rechargeable batteries at 12 volts each. Acceleration and speed are systematically controlled via the twist-grip mechanism on the handlebar. Slowing down or coming to a complete stop is accomplished by the dual disc brakes that are activated by hand, similar to what real motocross bikes have. 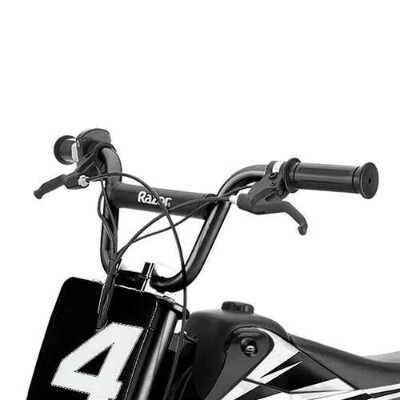 The angle of the riser-style of handlebar can be adjusted accordingly so your kid will not be complaining about uncomfortable handling of the SX500. 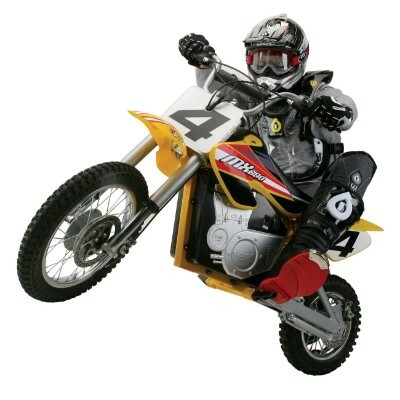 If your child is no longer a kid but a teenager, then you will need a more serious piece of motocrossing equipment. You will need the MX650 Rocket. 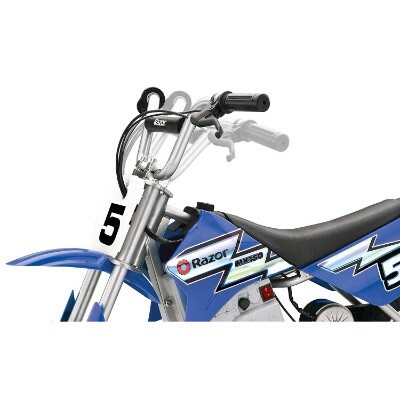 This Razor machine is the ideal preparatory dirt bike for your child who has clearly outgrown smaller bikes. It has the same steel construction as in any other Razor dirt bike allowing even adults up to 220 pounds to take it to greater heights. 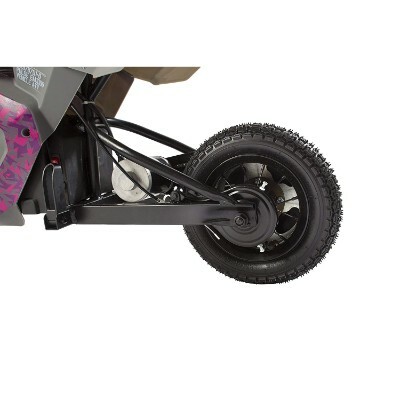 Its variable speed, chain-driven, high torque, and super silent electric motor is enough to haul your kid to any type of terrain. It’s got asymmetrical knobby, motocross-grade tires which is essentially larger up front at 16 inches and smaller yet fatter in the rear at 14 inches. The MX650 has 36 volts of powerful batteries allowing it to climb any hill or traverse any terrain. Its twist-grip speed and acceleration controls make for remarkable maneuverability. For outstanding riding comfort, the MX650 boasts of performance grade dual suspension on a double crown fork system. This is perfect for those flying stunts that are the envy of other bikers. The fully adjustable handlebars are of the riser style with hand-operated brake systems delivering outstanding stopping power to both wheels. The MX650 is a monster bike for teenagers not necessarily kids. 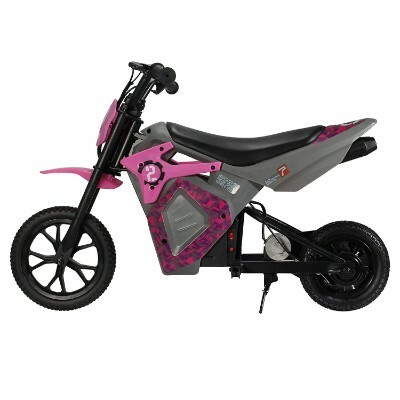 As long as your child doesn’t see himself as an adult yet, he or she can ride the MX650. This isn’t just a starter bike for teens before giving them the real deal, this is a motor vehicle within itself for any age! Your 16 year old can already have their driver’s license and still wanna tool around on this bad boy! We don’t even know if this could be classified as “toy”! Parents can even buy one for themselves to make it a family activity, with maximum weight capacity up to 220lbs. The dual suspension, ride and maneuverability, make this almost equal to a gas-powered bike, with the only exception being the speed limit. 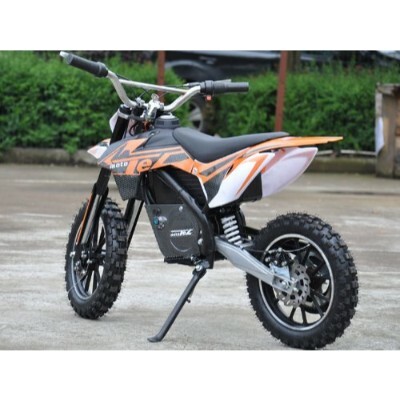 Of all the electric dirt bikes we have in our list, we have to admit the Moto Tec 24V 500W Electric Dirt Bike is the closest you can get to the look of a real Motocrosser. Once your child has grown accustomed to the operation and handling of the Moto Tec, you can now adjust the speed limit to 10 miles per hour. If you think your child is already a master, a pro on the Moto Tec, you can now adjust the speed settings to its fullest at 16 miles per hour. It has excellent styling that boasts of a very high ground clearance allowing kids to maneuver even difficult terrain. The handlebar is wider than most of our dirt bikes in this list and its front and rear tires are superbly knobby. On the handlebar is the throttle mechanism that conveniently shifts in 3 highly variable speed settings. This is for the child that already has a higher level of confidence than average for their age range, but not quite the aptitude of an older child. For that reason the three-speed variable is the ideal design for building more confidence in your child with time. Skill and learning ability are a process, and with this dirt bike it doesn’t have to be a boring one! While your child adjusts to the terrain and speed variables, it’s ensured that this ride will be the smoothest with it’s high clearance for more rocky landscapes. Not to mention it’s classic knobby tire design for traction! The Moto Tec’s 3 lockable speed settings is what we found very important. This is also echoed by the parents who have already bought the dirt bike. At least, your kid will be able to master the Moto Tec in a progressive manner. 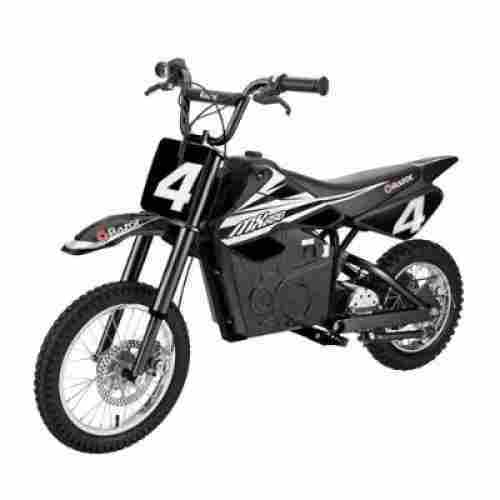 Get your kids ready to hit the trails with this electric motocross bike that features a 500-watt powerful engine. The engine can reach speeds up to 15 miles per hour and carry riders that weigh up to 175 pounds. With an authentic dirt bike frame geometry including a high-torque and variable speed motor this dirt bike will deliver the supercharged experience that the thriller seeker in your life is looking for. Large tires make this a smooth ride, and older kids will be able to handle it with ease. This bike will get them up the tallest hills and the down the best paths. Don’t be the one left behind in the dust. As a parent, we know that your job is to evaluate and consider all factors for safety and skill level -- and so here’s our answer to any concerns! Not to worry, since an upgrade will be coming soon enough! While this bike sits at the median of our age ranges for our other designs, this is far from an in-between bike or a compromise! The 2-3 mph difference would be hardly noticeable to your child. They’d just be too busy having fun with it on the road! The super large tires make sure that the rider enjoys a smooth ride with the best power transfers possible plus the dual disc brakes ensure that they are able to smoothly control the bike through rough terrain. Each charge will offer the rider 40 minutes of continuous riding experience which is just enough for them to enjoy the ride without getting too adventurous. What is there not to like about the MX500? We’re a little confused about the classification of Razor for its products, though. We think it would have been better to just come up with a single design with a fully adjustable speed settings because, technically, this is the only thing that separates the MX500 from the MX350 and MX650. If the 1-year minimum age difference between the MX350 and MX500 or the 2-year difference between the MX500 and the MX650, we’d say we’d better get the MX650. 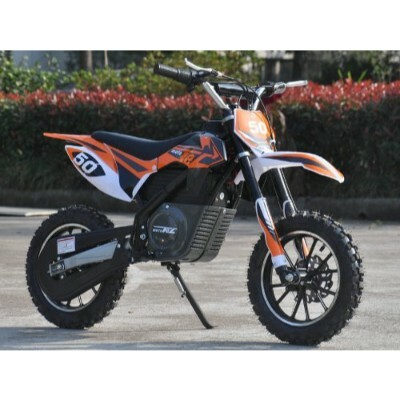 If you’re looking for an inexpensive yet truly functional and stylish dirt bike that’s powered by a very quiet motor for your 8 year old kid, then how about taking a closer look at the EM-1000 E-Motorcycle? The smoothest ride for a child of around 8 or 9! This bike goes about the right speed with the perfect amount of balance, by alternating between the front and rear suspension of a pneumatic system in the rear against the knobby tire design upfront. t’s still just as durable with a high-grade design, but not getting too out of control with the 100 watt chain driven electric motor. This is the dream bike designed as an intro for a future life of high adventure on the road! The EM-1000 is constructed of premium grade steel for its fabulous dirt bike frame. Its knobby front tire is designed to be resistant to punctures while its rear tires are fully pneumatic to help provide a more comfortable ride. It also has a twist-grip throttle system which is lifted from the Instant Throttle Response systems of professional motocross. This blue or pink electric dirt bike is driven by a 100-watt super quiet, chain driven engine powered by a rechargeable battery system that packs 24 volts of energy. This is enough to let your child enjoy the EM-1000 for about 40 minutes. The cost of the EM-1000 is truly one of its strongest points. Its features don’t disappoint as well. Technically you have the perfect balance between affordability and functionality. More popular for their Kick N’ Go series, Pulse Performance is nevertheless a trustworthy company you can depend on to churn outstanding products. 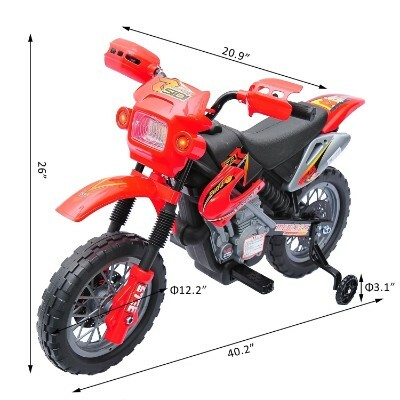 When selecting the best-sized dirt bike and engine size for your young rider it is important to consider the following; their experience level, their height, and their weight. These three factors all add into the equation that allows you to select the most comfortable and secure bike for the young rider. When you have a bike that is too small or too large for the rider it can really become unsafe. Encouraging young riders compete adds to their self-esteem and self-confidence. This allows them to compete in an environment where it allows them to do something they are passionate about while also benefiting physically and mentally. Also, encourage lots of practice and safety when helping a young riding enter the world of competitive riding. This is something that is very important. Experience level, height, and weight are all factors that need to be considered when purchasing a bike for a young rider. The more experienced and more the rider weighs the bigger bike and engine riders are able to handle.We provided bikes on the list for both new and learning dirt bike riders. This makes sure that we are able to suggest dirt bikes that meet the needs of all young riders. We want to make sure that any item that is listed will be safe for your child along with providing hours of fun. The bikes listed are all small enough for young riders to be able to ride themselves. Riding dirt bikes at a young age offers many developmental benefits. The benefits are both physical and mental. The physical benefits of riding a dirt bike at a young age are; increased balance control, better endurance during physical activities, and promote an active lifestyle outdoors. All of the physical benefits lead to a more active and healthier lifestyle for young riders. 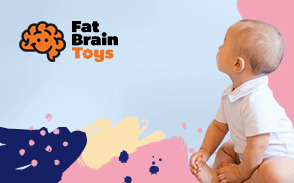 Physical development is just an important as mental development in young children. When young riders are able to ride it mentally helps their development with increased brain stimulation and adds to their cognitive dexterity. These mental benefits activate parts of the brain when riding that improves their cognitive functions. The amount of brain stimulation is directly linked to people who have higher test scores and perform well in and out of school. Riding a dirt bike offers many benefits to both their physical and mental development for young riders. 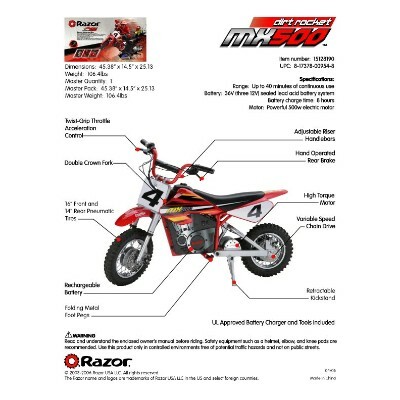 We constructed the list of great rated small dirt bike our team of experts then reviewed the list to suggest only the best dirt bikes with the highest safety and customer ratings. Both safety and customer ratings are reviewed to help compose the list. We want to make sure the bike is safe and also that it will meets the needs of young riders. The list displays 10 of the Best Dirt Bikes for Young Riders that our experts could find. We hope that you are able to review the items and find a bike that is best for your young rider. q: Are dirt bikes safe for young riders? Dirt bikes are safe for young riders when the size of the bike is correct, when they are able to understand the safety of proper dirt bike riding, and when they are taught under adult supervision. Dirt bike riding can be safe along with a lot of fun for young riders. It encourages a fit and active lifestyle that is important in the development of young children. q: At what age is it best to allow a rider to start riding dirt bikes? 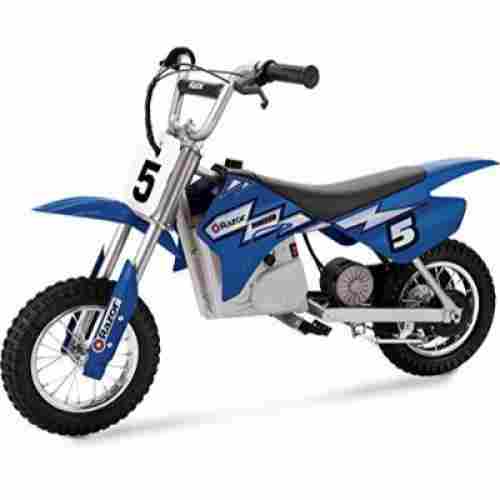 Children as young as the age of three can start with riding small electric dirt bikes and small engine gas powered dirt bikes. It is a very exciting and beneficial sport for young children. q: What are the different types of dirt bikes? 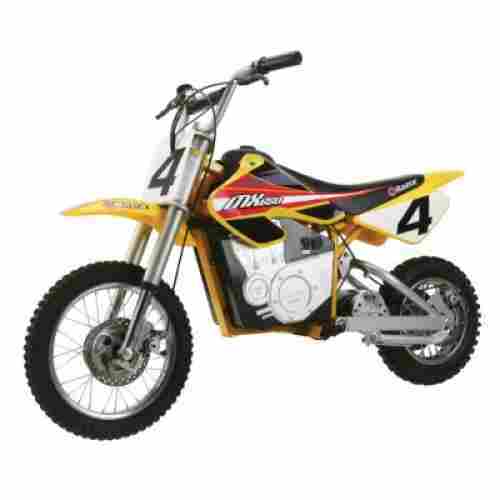 There are four different types of dirt bikes; motocross, trail, mini, and dual purpose. Each of these different styles of dirt bikes is designed for different environments and terrain. It is important to research and understand the different types before presenting a dirt bike to a young rider. q: What type of dirt bike is best for a young rider riding in the backyard? An electric powered dirt bike is best for backyard riding. This kind of dirt bike is very quiet and also is not as powerful as other gas powered dirt bikes. They are ideal for smaller areas and offer smaller bikes for younger riders. q: Where can I buy the dirt bikes listed on the 10 Best Dirt Bikes for Young Riders? You can purchase the bikes listed on the 10 Best Dirt Bikes for Young Riders by clicking the link to Amazon below each picture of the product. 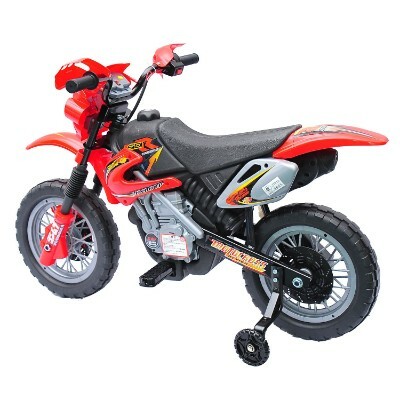 This link will take you directly to Amazon where you can purchase the dirt bike. q: What are the differences between electric powered and gas powered dirt bike engines? The difference between electric and gas powered dirt bikes is the fuel for the engine. Gas powered engines require gas while electric powered dirt bikes use to recharge batteries. Often gas powered dirt bikes have a longer riding time, but always require more and more gas to be operated. Battery powered of electric dirt bikes have a shorter runtime, but can just simply be recharged for the next ride.